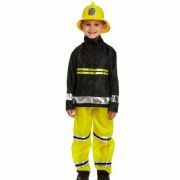 "When I grow up I want to be..." well whatever your little one wants to be when they grow up, they'll surely love dressing up as them now, so we've got a cool collection of childrens fancy dress costumes from lots of different professions. We have uniforms for both boys and girls such as a Policeman costume and a Convict outfit too! For those that think travelling is their thing we've got an Aviator and Ships Captain costume. For the rough and tumble army type there's our Special Forces Paratrooper, Army Solider and Royal Guard costumes. Plus many more!